Home Destinations Wellness Trends in the U.S.
Grand Palace Suite at Omni Scottsdale Resort & Spa at Montelucia’s Joya Spa. Wellness travel and spa escapes are more than the buzz words du jour. According to Virtuoso, there are six wellness travel segments that are here to stay for 2018—visiting masters, which allows guests to learn from gurus; sugar detox; grief retreats, aimed at guests seeking solace and healing after the passing of a loved one; medical testing, which allows guests to go through a variety of tests to determine issues and how to best treat them; sleep therapy and sleep recovery, focusing on stress management, internal coping mechanisms, and fitness programs such as yoga; and silence, a sort of digital detox where guests can disconnect by staying in guestrooms with WiFi blockers, taking quiet mindfulness sessions and meditative walks and meditation sessions to allow themselves to slow down. Recommend a yoga class at Pechanga Resort & Casino. At the Omni Scottsdale Resort & Spa at Montelucia’s Joya Spa, guests can opt for the spa’s modern take on the hammam experience. The experience takes place in an aromatherapy hammam room that features iridescent heated seats contoured to address the body’s pressure points, as well as a self-guided journey through a traditional circuit of steam, whirlpool, and cold plunge, and a scrub with traditional Moroccan black soap and essential oils. For a locally immersive spa experience, recommend the Detox Clay Wrap, which uses a clay wrap with essential oils. Deanne Boynton Grupp, v.p. of tourism, Experience Scottsdale, points out, in fact, that “many Scottsdale spas are incorporating ingredients that are native to the area such as clay (from Sedona), pure Arizona honey, aloe vera, and jojoba oil. Pechanga Resort & Casino recently completed a $285 million expansion, which included a 568-guestroom and -suite tower, the 25,000-sq.-ft., 2-story day spa, and a new restaurant. In March, the property’s official grand opening will include the completion of the second new restaurant, and The Cove, the property’s pool complex. With the addition of a new spa, comes a new focus for the property. “We are changing the dialogue on the casino experience. We are providing different alternatives for indulgence. Indulge in self-care. Indulge in serenity with our signature spa treatments. Indulge in a yoga or wellness class. Indulge in feeling good about yourself,” says Ko. 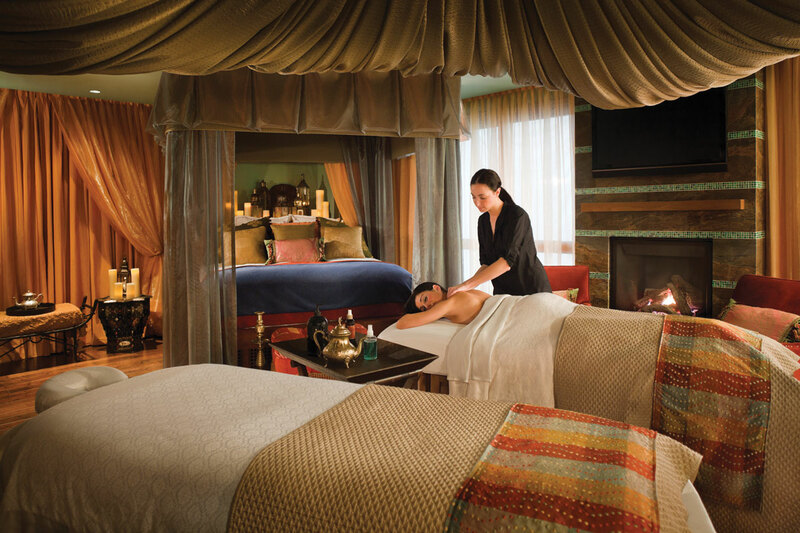 Residing on the reservation of the Pechanga Band of Luiseno Indians, the spa incorporates native healing elements, and wellness is interwoven throughout the treatments with a focus on natural healing. Unique treatments include the Great Oak Purification—located on the reservation is the 2,000-year-old Great Oak tree, said to be sacred to the native people; and the Acorn and Walnut Scrub—acorns are what nourished the Pechanga tribe for years. Guests can also opt for a Guided Meditation during a manicure and/or pedicure treatment, or sign up for a yoga class. In Maui, The Fairmont Kea Lani’s Willow Stream Spa offers an array of wellness options—from meditation and breathing classes to yoga therapy for lower back pain. There are also locally inspired spa treatments with Maui-sourced products, plus an array of fitness classes including Pilates, aqua fitness, body definition and obstacle courses. Cool spa offerings include the Waterfall Suite, with Vichy shower treatments inspired by the Maui rain, and a palolo (mud) bar. Guests seeking a private island getaway can head south, way south to Key West, where they’ll jump on a boat that will whisk them away to Sunset Key Cottages, with a range of high-end cottage accommodations. Here, they can take a complimentary Saturday morning yoga class at The Point while gazing out at the ocean, or they can spend a day at the Spa at Sunset Key. Recommend couples request a Signature Romance Package, which includes two 80-minute massages with dinner for two and a bottle of champagne. Massages and dinner are available beachside or in one’s private cabana (priced at $1,250). The resort even has a workout gear-lending program for $5 for guests who might’ve forgotten their personal gear.